Fundraising by Political Action Committees in Michigan is on a record-setting pace for a Presidential election year. That could mean very expensive races for state House this fall. The Michigan Campaign Finance Network examined reports through April 20th. Director Craig Mauger says the second quarter filings showed the top 150 PACs in Michigan raised $26-million, a 17% increase over 2012. "The expectation around Lansing from people that I talk to is that this will be an expensive battle for the state House"
$32-million had been raised by state PACs at this point in 2014. But Mauger says the dynamics of elections are different in so-called “off year.” In 2014 races for governor and other statewide offices drew lots of money from outside of Michigan. Mauger says there is an expectation that Democrats will pick up seats, but it’s not clear if they will pick up the nine needed to take control of the state House. While PACs are busy raising money, some state lawmakers are trying to put more limits on how much they can contribute to candidate committees. Legislation was introduced last month with a bi-partisan list of co-sponsors, including Kalamazoo Democrat Jon Hoadley. It would cut in half the amount that PACs can give to candidates. Right now PAC’s can give ten times the amount that individual contributors can give. Mauger says it’s an interesting proposal, but it’s not likely to get much traction in the Legislature. More than $3-million was raised in the first quarter for candidates running for Congress in the state. But five of the 14 races stood out for the amount of money flowing in. 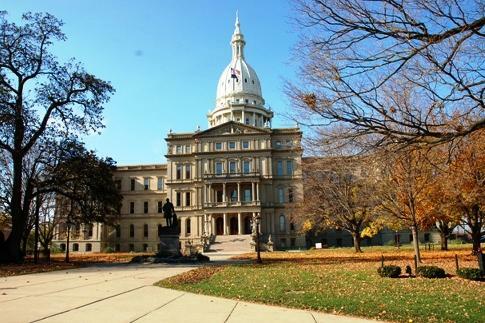 WSW: Watchdog Calls New Campaign Finance Laws "Terrible Public Policy"
If Donald Trump is a drag on the Republican ticket it could become very apparent in one Southwest Michigan state House race.